I need to confess: I’m officially late to the potatoes-are-awesome train. Not only are potatoes CRAZY CHEAP in the winter (like 10¢ per pound kind of cheap), but they’re SO versatile and easy to make. You can fry potatoes using the same method in my fried sweet potato recipe, but today I want to talk about the baked potato. 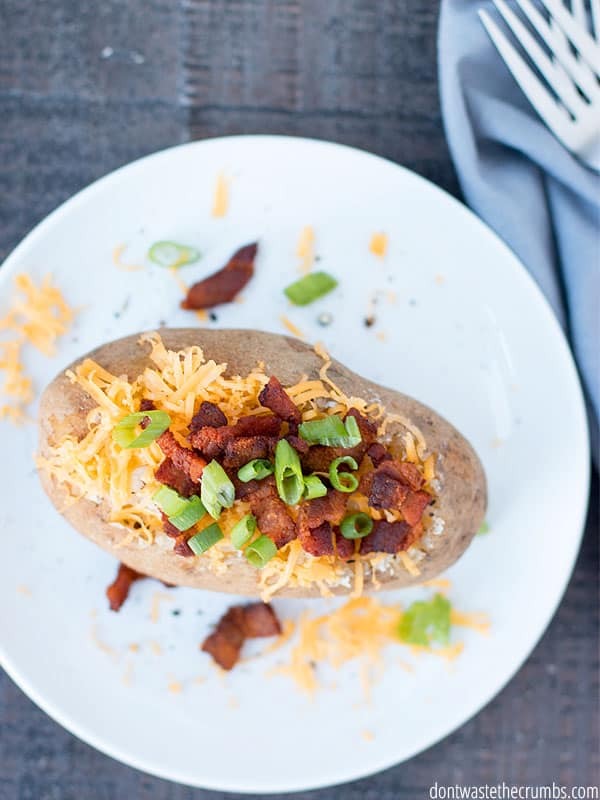 Specifically, 7 ways you can make a baked potato – fast! Now you may or may not know this, but it is entirely possible to ruin a baked potato. Which means a ruined dinner, wasted money and then calling for take-out (which is MORE wasted money), so let’s get some basic baked potato must-do’s out of the way. I use the term “wash” loosely because a wet potato makes for a bad baked potato – at least in my experience. And honestly, it’s not one I’m willing to test again. Because potatoes grow in the ground, and they are NOT washed before they’re shipped, they likely contain some sort of pesticide residue and definitely dirt. I can’t offer you much in the way of pesticide residue, UNLESS you want to wash the potatoes with homemade produce wash and then let them dry for at least a full day before baking. Your other option in terms of reducing pesticide residue is to buy organic potatoes. Although there are pesticides on organic produce, conventional potatoes have been on the Dirty Dozen in the past. They didn’t make it to the list in 2016, but I’m not sure if that’s because another fruit/vegetable beat them out, or if pesticide use and residue is truly lower on potatoes. As for taking care of the dirt, I’ve found that using a dish brush like this one works like a charm. We have one that’s dedicated just for produce, and use it to scrub the excess dirt off the potatoes. That means plenty of salt and pepper folks – don’t be shy. If you’re going to stuff or serve your baked potato according to a theme (like a Greek baked potato or a Mexican baked potato), then season your potato appropriately to enhance the theme of the night. For example, for a Greek baked potato I’d make a batch of homemade Greek salad dressing (minus the vinegar) and rub that instead of olive oil. OR I’d use just the dry blend of seasonings in addition to salt and pepper. Another idea, for a Mexican baked potato, is rubbing homemade taco seasoning on the potato. Have you heard the myth that if you don’t poke a potato before you bake it, that it will explode? It’s no myth folks, this be the TRUTH! Unless you are just itching to clean your oven (in addition to whatever else you’ve got to do today), poke your potato and poke it good. If you’re using a fork, that means poking the potato at least half-way down the prongs of the fork at each end, and all around. For the people who like specifics, that’s a minimum of 8 good pokes at the potato. I personally like to use a small paring knife, because for one reason or another I can never seem to get my fork OUT of the potato once I’ve poked it. 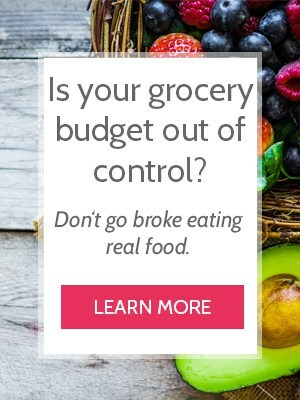 That is, unless I want a broken fork or a black eye. If you’re using a knife, poke the potato twice at each end, alternating so that if you poke the potato “north” and “south” at one end, you’re poking it “east” and “west” at the other end. A total of 4 good pokes will do the job, with a “good poke” meaning sticking the knife into the potato at least ½ inch. If the potato is exposed, cover with olive oil. A baked potato is either wrapped (typically with aluminum foil) or not wrapped. When it’s wrapped, you’re essentially steaming the potato inside the foil. When it’s not wrapped, you’re drying out the skin and ruining the potato – unless you cover it with olive oil. Rubbing the potato skin down with olive oil helps keep the potato moist AND makes the skin crispy. And who doesn’t like a crispy potato skin? There’s a myth out there about olive oil being watered down, and unfortunately that myth is fact too. Here’s how to test your olive oil to see if it’s fake, and then qualities to look for when you’re buying olive oil. There’s actually more than one way to cook a baked potato in the oven, and they’re all pretty awesome in their own right. Let’s give each method its own due credit, shall we? 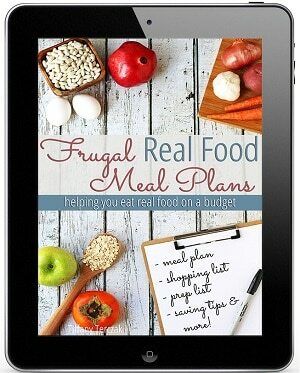 This is the method that most of us probably grew up with, which is why I’m listing it first. I’m not trying to “get it out of the way” or anything – quite the opposite. 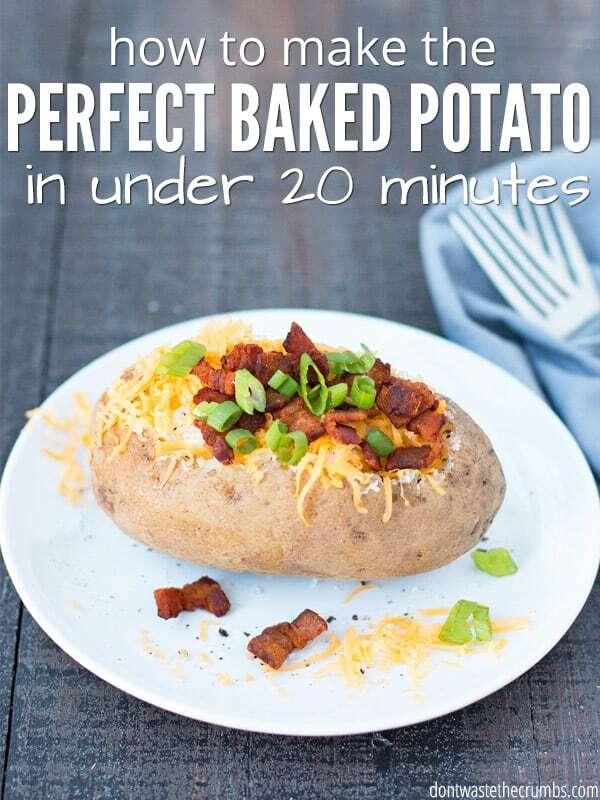 It’s actually one of the best ways to make a baked potato that turns out absolutely perfect, every time. Soft skin on the outside, tender and fluffy on the inside. Method: Preheat the oven to 425F. Wash and poke the potatoes. Season with salt and pepper (olive oil is optional). 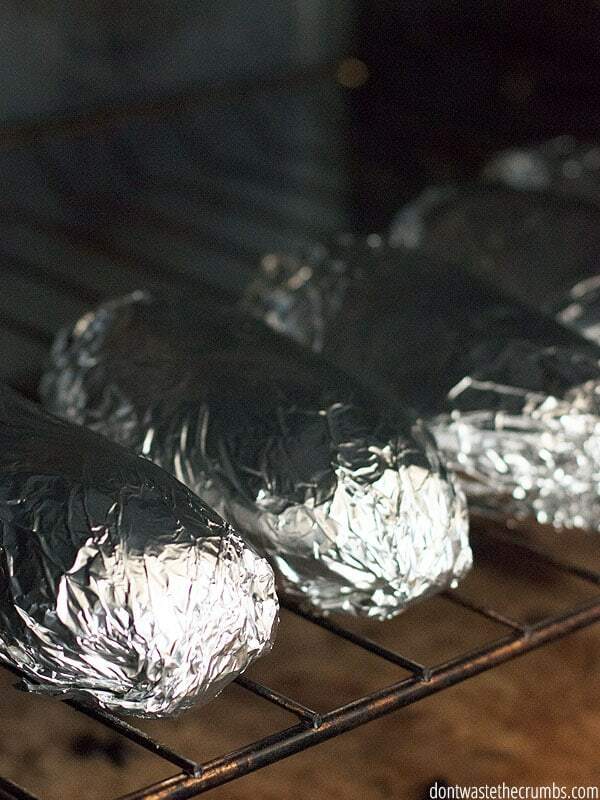 Wrap the potatoes in aluminum foil and place directly on a baking rack. Bake for 45-60 minutes, or until a fork is easily inserted to the middle of the potato. This method is the one most likely to “wow” your guests. Everyone knows a baked potato is usually soft… but a baked potato with crispy skin?! They’ll wonder how you did it! Lucky for you, it’s no magic trick. It’s all because of the oil. Method: Preheat the oven to 425F. Wash and poke the potatoes. Cover thoroughly with olive oil and season with salt and pepper. Place potatoes directly on a baking rack or on a cookie sheet and bake for 45-60 minutes, or until a fork is easily inserted to the middle of the potato. This method isn’t exactly true to the classic baked potato one for big reason: the potatoes aren’t whole. But if you want to get technical about it, it IS still a baked potato… it’s just pre-cut in half for you! I like this method because it’s like a really big French fry. The skin is crispy, the outside flesh is crispy and yet the insides are still tender and soft. Plus the cooking time is practically cut in half! Method: Preheat the oven to 425F. Wash and poke the potatoes. Cut each potato in half lengthwise and cover thoroughly with olive oil. Season with salt and pepper. Place the potatoes on a cookie sheet, cut side down, and bake for 35-40 minutes or until a fork is easily inserted to the middle of the potato. I’m personally not a huge fan of cooking dinner in the microwave, but I’m also a real human being who sometimes forgets to start dinner on time. When this happens, the microwave can be a real life saver. There two drawbacks to cooking a baked potato in the microwave. You lose all possibilities of crispy skin. Unless you know something I don’t know, there is no way you’ll get crispy skin in the microwave alone. It’s just not scientifically possible. Sometimes the inside of the potato can be tough and mealy. 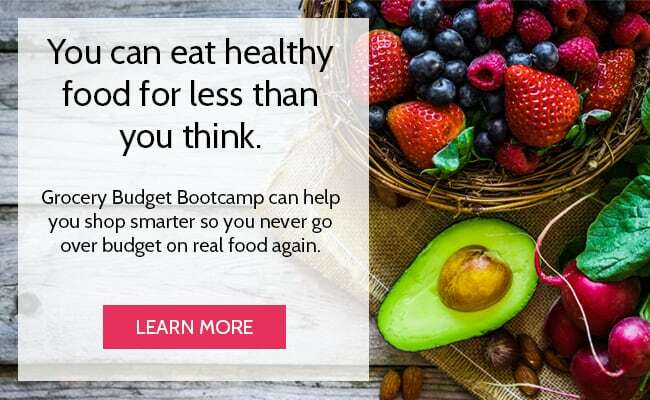 This might not be a big deal if you’re living in a college dorm and you’re going to top your potato with gobs of cheese, bacon and sour cream anyway. Or if you’re a family of one and don’t really feel like messing with the oven for just yourself. BUT, I’m just letting y’all know. If you make a baked potato in the microwave and you don’t like how it turns out, don’t say I didn’t warn you. Method: Wash and poke the potatoes. Place the potato directly in the microwave and cook on high for 5 minutes. Using an oven mitt or towel (because the potato will be HOT), turn the potato over and cook for another4-5 minutes, depending on the size of the potato. Note that you can cook two potatoes at a time using this method, but if you cook three or more, you will likely have to adjust the cooking time. I tried to come up with some clever joke, like “what did the potato say to the microwave when he saw her with the oven,” but I’m not really good at jokes so let’s just get straight to the point. Starting a baked potato in the microwave and finishing it in the oven gives you the perks of a quicker cook time AND the crispy skin on the outside. Method: Preheat the oven to 425F. Wash and poke the potatoes. Place the potato directly in the microwave and cook on high for 5 minutes. Using an oven mitt or towel (because the potato will be HOT), remove the potato. When it is just cool enough to handle, cover with olive oil and season with salt and pepper. Place potatoes directly on a baking rack or on a cookie sheet and bake for 10-20 minutes, or until a fork inserts easily into the middle of the potato. Now THIS method deserves an award. You know how the potato comes out amazingly perfect in the oven? You can get the same results using the slow cooker! The biggest pro to using a slow cooker is that you can cook LOADS of baked potatoes at the same time without even being home. My 6-quart slow cooker holds 5 MASSIVE potatoes. I’m sure it would hold at least 8 normal size potatoes, if not more. There’s another pro and one major con to using a slow cooker to make a baked potato, and it’s the same thing: it takes all day to cook. 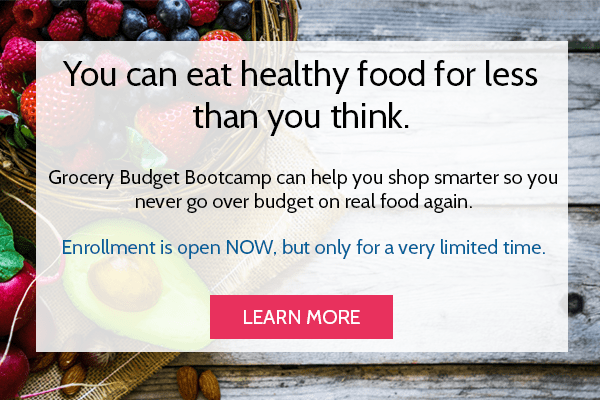 For those who are capable of planning ahead, this is great news! You can wash and wrap the spuds the night before and just hit “go” before you walk out the door. Eight hours later you’ll come home to perfectly baked potatoes, just waiting to be topped. For those who are live in the land of forgetfulness, this is bad news. That moment when you remember that you forgot to pull something out for dinner and you have to leave in 30 minutes? Welp, you should have thought about those potatoes eons ago. Luckily for you though, there is the microwave method. Method: Wash and poke the potatoes. Season with salt and pepper (olive oil is optional). 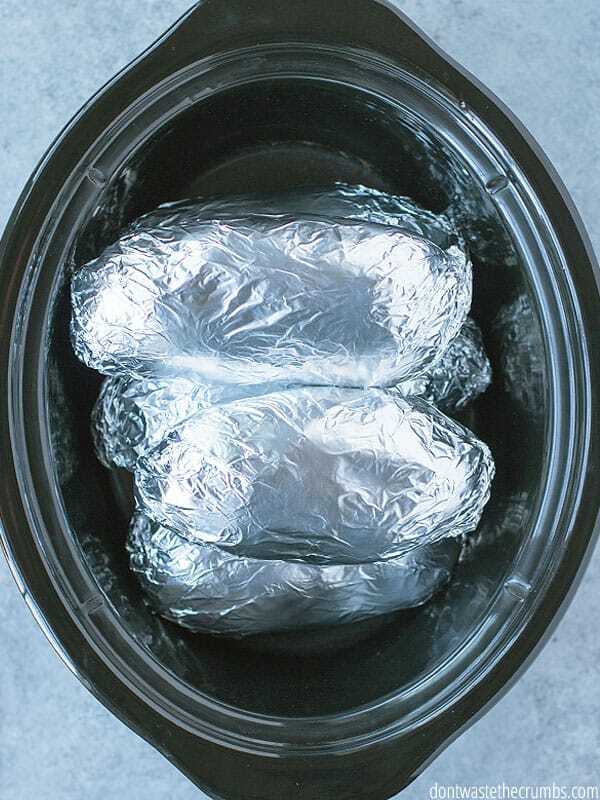 Wrap the potatoes in aluminum foil and place directly in the slow cooker. Cover with the lid and cook on high for 4 ½ to 5 hours, or on low for 7 ½ to 8 hours, until a fork inserts easily into the middle of the potato. Can you Make Baked Potatoes in the Instant Pot? I have to admit that in addition to being late to the potatoes-are-awesome train, I’m also late to the instant pot craze. Yet – I’ve got my eye on this one! Method: Preheat the oven to 425F. Wash and poke the potato and place in a ceramic or steel bowl. Measure two cups of water into the inner pot and place the bowl (with the potatoes) on top of the steam rack. Choose the “steam” program with 12 minutes time (or 15 minutes if you have massive potatoes weighing 1lb+ each). When the program is done, release the steam and take the potatoes out. 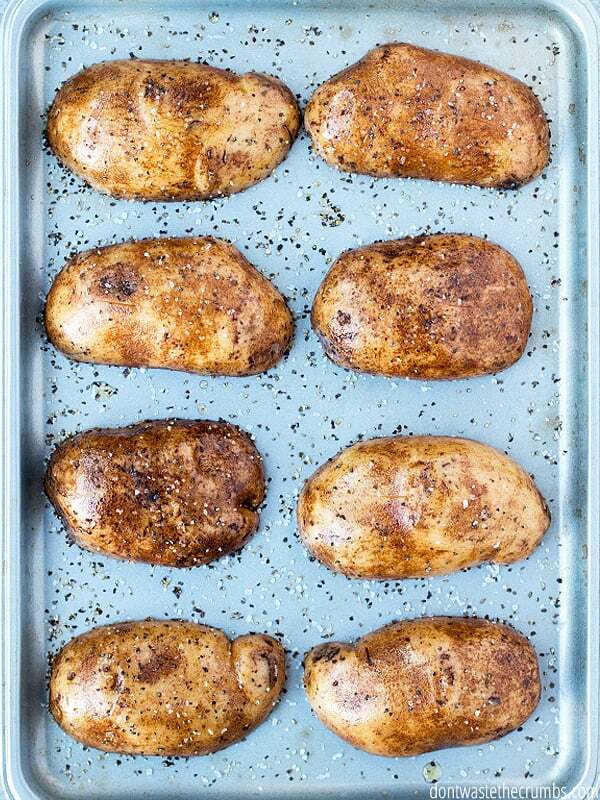 Cover the potato with olive oil and place in the oven for 5 minutes to crisp the skin. And there you have it folks – 7 ways to make a baked potato. The microwave method can get it done in about 10 minutes, while the traditional oven will take just under an hour! Baked potatoes are a great way to get Real Food on the Table, FAST. 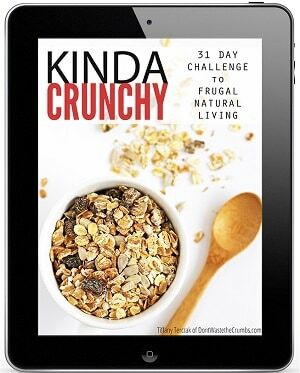 Learn some more quick dinner ideas in this 5 Day Challenge. What’s your go-to method for making a baked potato? Maybe I’ve just been lucky, but I’ve never had a potato explode on me before and I’ve never poked one either. Mind you I do always wrap with foil, so maybe that’s what’s saved me all these years. Thanks for this list. Very helpful. I do loved baked potatoes! I often do have to resort to the microwave, though; maybe I should get an instant pot. I wanted to note that there is no way to wash pesticide residue off potatoes. Since they are underground crops, the pesticides are absorbed from the soil; it’s not just residue on the outside. And some nasty pesticides are used on conventional potatoes. I always used to buy organic potatoes, but they are MUCH more expensive. Fortunately, my family is now able to grow our own. We harvested over 100 lbs last season. They are easy to grow if you have space! You’re most welcome Katie! I appreciate the update on the potatoes – I wonder how well they grow in Georgia, lol. Really welll in heavily amended soil or a raised bed! Hit up the hardware store now for seed potatoes! I use a version of #3- microwave then grill. Starting the potato in the microwave and finishing it on the top rack of the grill saves me from using the oven during our hot months in SC. 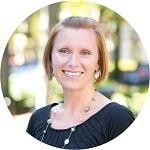 Ooh – good idea Erin! I’ll borrow that come summer here in Hotlanta! Very helpful post ! Thank you so much ! My favorite way to bake potatoes ( russet or sweet potatoes) is to rub the outside with olive oil and sea salt. I then poke them and place them in my cast iron skillet and bake until they are tender. The skin is crispy, especially the bottoms that touch the skillet. Delicious! I appreciate the other methods you have given because occasionally I don’t have the time to bake them fully in the oven. Thank you!! I haven’t heard of baking a potato in a cast iron skillet before CarolSue – can you give details? Is it in the oven? Stove top? Do you turn it at all? I don’t like russets or yukons done in the microwave but small red potatoes are great. I turn the microwave on for 2-5 minutes on high, depending on the quantity. Then when the microwave goes off, I open the door, cover the potatoes with a large bowl or casserole dish, close the door quickly, and let them sit there for 5 more minutes. They come out creamy inside and so good. Thanks for posting this! I never knew to use olive oil on the skin! You honestly just brightened my day, my bf will be so impressed! Thank you for all the tips! You’re most welcome Ashley! I hope he enjoys it!! Quick tip on microwave baked potatoes… After washing and stabbing the potato place it inside a plastic grocery bag (Walmart Bag) while wet. Twist up the bag and cook for 5 mins. That’s it your done! I guess its essentially steaming the potato, but it prevents drying out your potato and its super fast.